(a) “Active treatment for developmental disability” means a continuous program for an individual who has a developmental disability that includes aggressive, consistent implementation of specialized and generic training, treatment, health services and related services, that is directed toward the individual’s acquiring behaviors necessary for him or her to function with as much self-determination and independence as possible and that is directed toward preventing or decelerating regression or loss of the individual’s current optimal functional status. “Active treatment for developmental disability” does not include services to maintain generally independent individuals with developmental disability who are able to function with little supervision or in the absence of active treatment for developmental disability. (b) “Active treatment for mental illness” means the implementation of an individualized plan of care for an individual with mental illness that is developed under and supervised by a physician licensed under ch. 448 and other qualified mental health care providers and that prescribes specific therapies and activities for the treatment of the individual while the individual experiences an acute episode of severe mental illness which necessitates supervision by trained mental health care providers. 1. Significantly subaverage general intellectual functioning that is concurrent with an individual’s deficits in adaptive behavior and that manifested during the individual’s developmental period. 2. A severe, chronic disability that meets all of the conditions for individuals with related conditions as specified in 42 CFR 435.1009. (d) “Licensed health professional” has the meaning given under 42 USC 1396r (b) (5) (G). (e) “Managing employee” means a general manager, business manager, administrator, director or other individual who exercises operational or managerial control over, or who directly or indirectly conducts, the operation of the facility. (f) “Medicare” means coverage under part A or part B of Title XVIII of the federal social security act, 42 USC 1395 to 1395zz. (g) “Mental illness” has the meaning given under 42 USC 1396r (e) (7) (G) (i). (h) “Nurse aide” has the meaning given under 42 USC 1396r (b) (5) (F). (i) “Nursing facility” has the meaning given under 42 USC 1396r (a). (j) “Physician” has the meaning given under s. 448.01 (5). (k) “Psychopharmacologic drugs” means drugs that modify psychological functions and mental states. (L) “Registered professional nurse” means a registered nurse who is licensed under ch. 441 or who holds a multistate license, as defined in s. 441.51 (2) (h), issued in a party state, as defined in s. 441.51 (2) (k). (m) “Resident” means an individual who resides in a nursing facility. (2) Requirements relating to provision of services. 1. A nursing facility shall care for its residents in such a manner and in such an environment as will promote maintenance or enhancement of the quality of life of each resident. a. Meet at least every 3 months to identify issues with respect to which quality assessment and assurance activities are necessary. b. Develop and implement appropriate plans of action to correct identified quality deficiencies. 3. A quality assessment and assurance committee described under subd. 2. may establish written guidelines or procedures for making therapeutic alternate drug selections for the purposes of s. 450.01 (16) (hm) if the committee members include a pharmacist, as defined in s. 450.01 (15). 3. Is periodically reviewed and revised by the team in subd. 2. after the conduct of an assessment under par. (c). a. Describes the resident’s capability to perform daily life functions and significant impairments in the resident’s functional capacity. b. Is based on a uniform minimum data set of core elements and common definitions specified as required under 42 USC 1395i-3 (f) (6) (A). c. Uses an instrument which shall be specified by the department by rule. d. Includes identification of the resident’s medical problems. 2. A registered professional nurse shall conduct or coordinate with the appropriate participation of health professionals, sign and certify the completion of an assessment under subd. 1. Each individual who completes a portion of the assessment shall sign and certify as to the accuracy of that portion of the assessment. 3. No individual may willfully and knowingly certify under subd. 2. a material and false statement in an assessment. 4. No individual may willfully and knowingly cause another individual to certify under subd. 2. a material and false statement in an assessment. 5. If the department determines by survey of a nursing facility or otherwise that an individual has knowingly and willfully certified a false assessment under subd. 2., the department may require that individuals who are independent of the nursing facility and are approved by the department conduct and certify assessments under this paragraph. a. Conduct an assessment under subd. 1. no later than 4 days after the admission of an individual admitted after September 30, 1990.
b. Conduct all of the assessments under subd. 1. for a resident of the nursing facility by October 1, 1991, for a resident who resides in the facility on that date; promptly after a significant change in a resident’s physical or mental condition; and, for every resident, no less often than once every 12 months. c. Examine a resident no less frequently than once every 3 months and, as appropriate, revise the resident’s assessment under subd. 1. to assure the assessment’s continuing accuracy. 7. The assessment conducted under subd. 1. shall be used in developing, reviewing and revising a nursing facility resident’s plan of care under par. (b). 8. A nursing facility shall coordinate an assessment conducted under this paragraph with the conduct of preadmission screening under s. 49.45 (6c) (b) to the maximum extent practicable in order to avoid duplicative testing and effort. a. Nursing services and specialized rehabilitative services to attain or maintain the highest practicable physical, mental and psychosocial well-being of each resident. b. Medically related social services to attain or maintain the highest practicable physical, mental and psychosocial well-being of each resident. c. Pharmaceutical services, including procedures that assure the accurate acquiring, receiving, dispensing and administering of all drugs and biologicals, to meet the needs of each resident. d. Dietary services that assure that the meals meet the daily nutritional and special dietary needs of each resident. e. An ongoing program, directed by a qualified professional, of activities designed to meet the interests and the physical, mental and psychosocial well-being of each resident. f. Routine dental services to the extent covered under the approved state medicaid plan and emergency dental services to meet the needs of each resident. 2. Services specified under subd. 1. a. to d. and f. shall be provided to a resident by qualified persons in accordance with the resident’s written plan of care under par. (b). b. Shall use the services of a registered professional nurse at least 8 consecutive hours per day, 7 days per week. a. The nursing facility demonstrates to the satisfaction of the department that the nursing facility has been unable, despite diligent efforts including offering wages at the community prevailing rate for nursing facilities, to recruit appropriate personnel. b. The department determines that a waiver of the requirement will not endanger the health or safety of nursing facility residents. c. The department finds that a registered professional nurse or a physician is obligated to respond immediately to telephone calls from the nursing facility for any periods in which licensed nursing services are not available. 5. A waiver under subd. 4. is subject to annual review by the department and to review by the secretary of the federal department of health and human services. The department may, in granting or reviewing a waiver, require the nursing facility to employ other qualified, licensed personnel. 2. A nursing facility may not use the individual as a nurse aide unless the nursing facility has inquired of the department concerning information about the individual in the registry under s. 146.40 (4g). 3. A nursing facility shall provide the regular performance review and regular in-service education that assures that individuals used as nurse aides are competent to perform services as nurse aides, including training for individuals to provide nursing and nursing-related services to nursing facility residents with cognitive impairments. 1. Require that the health care of every nursing facility resident be provided under the supervision of a physician. 2. Provide for the availability of a physician to furnish necessary medical care in case of emergency. a. Written plans of care, as required under par. (b). b. Assessments, as required under par. (c). c. Results of any preadmission screening conducted under s. 49.45 (6c) (b). (g) A nursing facility with more than 120 beds shall employ full-time at least one social worker with at least a bachelor’s degree in social work or similar professional qualifications to provide or assure the provision of social services. (3) Resident’s rights; general rights. 1. The right to choose a personal attending physician, to be fully informed in advance about care and treatment, to be fully informed in advance of any changes in care or treatment that may affect the resident’s well-being, and, except with respect to a resident who is adjudicated incompetent, to participate in planning care and treatment or changes in care and treatment. b. Upon the written order of a physician that specifies the duration and circumstances under which the restraints are to be used, except in emergency circumstances until the order could reasonably be obtained. 3. The right to privacy with regard to accommodations, medical treatment, written and telephonic communications, visits, and meetings of family and of resident groups, except that this subdivision may not be construed to require provision of a private room. 4. The right to confidentiality of personal and clinical records. b. To receive notice before the room or roommate of the resident in the nursing facility is changed. 6. The right to voice grievances with respect to treatment or care that is or is not furnished, without discrimination or reprisal for voicing the grievances, and the right to prompt efforts by the nursing facility to resolve grievances that the resident may have, including those with respect to the behavior of other residents. 7. The right of the resident to organize and participate in resident groups in the nursing facility and the right of the resident’s family to meet in the nursing facility with the families of other residents in the nursing facility. 8. The right of the resident to participate in social, religious and community activities that do not interfere with the rights of other residents in the nursing facility. 9. The right to examine, upon reasonable request, the results of the most recent survey of the facility conducted by the federal department of health and human services or the department with respect to the nursing facility and any plan of correction in effect with respect to the nursing facility. 10. Any other right specified in rules that the department shall promulgate in conformity with federal regulations. 1. Inform each resident, orally and in writing at the time of admission to the nursing facility, of the resident’s legal rights during the stay at the nursing facility, including a description of the protection of personal funds under sub. (8) and a statement that a resident may file a complaint with the department under s. 146.40 (4r) (a) concerning misappropriation of property or neglect or abuse of a resident. 2. Make available to each resident, upon reasonable request, a written statement of the rights specified in subd. 1. which is updated upon changes in nursing rights. b. Of changes in the items and services described in subd. 3. a. and of changes in the charges imposed for items and services described in subd. 3. a. 4. Inform each other resident, in writing before or at the time of admission and periodically during the resident’s stay, of services available in the nursing facility and of related charges for the services, including any charges for services not covered under medicare or by the nursing facility’s basic per diem charge. (c) For a resident who is adjudicated incompetent in this state, the rights of a resident under this subsection devolve upon and, to the extent determined necessary by a court of competent jurisdiction, are exercised by the resident’s guardian. (d) Psychopharmacologic drugs may be administered to a resident only on the orders of a physician and only as part of a plan included in the written plan of care under par. (b) designed to eliminate or modify the symptoms for which the drugs are prescribed and only if, at least annually, an independent, external consultant reviews the appropriateness of the drug plan of each resident receiving the pharmacologic drugs. (4) Resident’s rights; transfer and discharge rights. 1. The transfer or discharge is necessary to meet the resident’s welfare and the resident’s welfare cannot be met in the nursing facility, as documented by the resident’s physician in the resident’s clinical record. 2. The transfer or discharge is appropriate because the resident’s health has improved sufficiently so that the resident no longer needs the services provided by the nursing facility, as documented by the resident’s physician in the resident’s clinical record. 3. The safety of individuals in the nursing facility is endangered, as documented in the resident’s clinical record. 4. The health of individuals in the nursing facility would otherwise be endangered, as documented by a physician in the resident’s clinical record. 5. The resident has failed, after reasonable and appropriate notice, to pay or have paid on his or her behalf under medical assistance or under medicare for a stay at the nursing facility. If a resident becomes eligible for medical assistance after admission to the nursing facility, only charges that may be imposed under medical assistance may be allowed in enforcement of this subdivision. 6. The nursing facility ceases to operate. 1. Before effecting a transfer or discharge of a resident a nursing facility shall note in the resident’s record and notify the resident and, if known, an immediate family member of the resident or the resident’s legal counsel concerning the transfer or discharge and the reasons for it, at least 30 days in advance of the resident’s transfer or discharge, except that the nursing facility shall notify as soon as practicable in the circumstances specified in par. (a) 3. or 4.; in the circumstance specified in par. (a) 2. in which the resident’s health improves sufficiently to permit a more immediate transfer or discharge; in the circumstances specified in par. (a) 1. in which a more immediate transfer or discharge is necessitated by the resident’s urgent medical needs; or in the instance in which a resident has resided in the nursing facility fewer than 30 days. a. For transfers or discharges effected after September 30, 1990, notice of the resident’s right to appeal the transfer or discharge under a mechanism for hearing the appeals that is established by the department by rule. b. The name, mailing address and telephone number of the long-term care ombudsman program under s. 16.009 (2) (b). c. For a resident with developmental disability or mental illness, the mailing address and telephone number of the protection and advocacy agency designated under s. 51.62 (2) (a). (c) A nursing facility shall provide sufficient preparation and orientation to residents to ensure safe and orderly transfer or discharge from the nursing facility. a. The provisions of the approved state medicaid plan concerning the period, if any, during which the resident is permitted to return and resume residence in the nursing facility. b. The policies of the nursing facility regarding subd. 1. a., which shall be consistent with subd. 1. a. 2. At the time of a resident’s transfer to a hospital for therapeutic leave, a nursing facility shall provide written notice to the resident and an immediate family member or legal counsel of the duration of the period, if any, specified in subd. 1. a. 3. A nursing facility shall establish and follow a written policy under which a resident, who is eligible for medical assistance for nursing facility services, who is transferred from the nursing facility for hospitalization or therapeutic leave and whose hospitalization or therapeutic leave exceeds a period paid for by medical assistance for the resident, shall be permitted to be readmitted to the nursing facility immediately upon the first availability of a bed in a semiprivate room in the nursing facility, if at the time of readmission the resident requires the services provided by the nursing facility. (a) Permit immediate access to a resident by the department, by any representative of the secretary of the federal department of health and human services, by a representative of the board on aging and long-term care, by a representative of the protection and advocacy agency designated under s. 51.62 (2) (a) or by the resident’s attending physician. (b) Permit immediate access to a resident by immediate family or other relatives of the resident, subject to the resident’s right to deny or withdraw consent at any time. (c) Permit immediate access to a resident by others who are visiting with the consent of the resident, subject to reasonable restrictions and the resident’s right to deny or withdraw consent at any time. (d) Permit reasonable access to a resident by any entity or individual that provides health, social, legal or other services to the resident, subject to the resident’s right to deny or withdraw consent at any time. (e) Permit a designated representative of the long-term care ombudsman under s. 16.009 (4), with the permission of the resident or the resident’s legal counsel, and in accordance with s. 16.009 (4) (b) 1. d., to examine a resident’s clinical records. (6) Equal access to quality care. (a) A nursing facility shall establish and maintain identical policies and practices regarding transfer, discharge and the provision of services required under the approved state medicaid plan for all individuals regardless of payment. (b) Paragraph (a) may not be construed to prohibit a nursing facility from charging any amount for services furnished, consistent with the notice required under sub. (3) (b) 3. (c) Paragraph (a) may not be construed to require the department to provide additional services on behalf of a resident than are otherwise provided under the approved state medicaid plan. 1. A nursing facility may not require individuals applying to reside or residing in the facility to waive their rights to benefits under medical assistance or under medicare. 2. A nursing facility may not require oral or written assurance that individuals applying to reside or residing in the nursing facility are ineligible for or will not apply for medical assistance or medicare. 3. A nursing facility shall prominently display written information in the nursing facility and provide oral and written information to individuals applying to reside or residing in the nursing facility concerning how to apply for and use benefits under medical assistance and how to receive refunds for previous payments covered by these benefits. 4. A nursing facility may not require a 3rd-party guarantee of payment to the nursing facility as a condition of admission or expedited admission to or continued stay in the nursing facility. 5. With respect to an individual who is entitled to medical assistance for nursing facility services, a nursing facility may not charge, solicit, accept or receive, in addition to any amount otherwise required to be paid under the approved state medicaid plan, a gift, money, donation or other consideration as a precondition of admitting or expediting the admission of an individual to the nursing facility or as a requirement for the individual’s continued stay in the facility. 1. Prevent the department from prohibiting discrimination against individuals who are entitled to medical assistance under the approved state medicaid plan with respect to admissions practices of nursing facilities. 1m. Permit a county, city, town or village to implement nursing facility admissions policies that conflict with state law. 2. Prevent a nursing facility from requiring an individual who has legal access to a resident’s income or resources available to pay for care in the nursing facility, to sign a contract, without incurring personal financial liability, to provide payment from the resident’s income or resources for care in the nursing facility. 3. Prevent a nursing facility from charging a resident who is eligible for medical assistance for items or services that the resident has requested and received and that are not included in the approved state medicaid plan. 4. Prohibit a nursing facility from soliciting, accepting or receiving a charitable, religious or philanthropic contribution from an organization or from a person who is unrelated to the resident or potential resident, but only to the extent that the contribution is not a condition of admission, expediting admission or continued stay in the nursing facility. (8) Protection of resident funds. 1. May not require a resident to deposit his or her personal funds with the nursing facility. 2. Upon the written authorization of a resident, shall hold, safeguard and account for the resident’s personal funds under a system established and maintained by the nursing facility that is in accordance with par. (b). 1. The nursing facility shall deposit any amount of a resident’s personal funds in excess of $50 in an interest-bearing account that is separate from any of the nursing facility’s operating accounts and credits all interest earned on the separate account to the account. The nursing facility shall maintain a resident’s personal funds that do not exceed $50 in a noninterest-bearing account or petty cash fund. 2. The nursing facility shall assure a full and complete separate accounting of the personal funds of each resident for whom the facility has written authorization, maintain a written record of all financial transactions involving the personal funds of the resident deposited with the nursing facility and afford the resident or the resident’s legal representative with reasonable access to the record. a. When the amount in the resident’s account is $200 less than the dollar amount permitted under 42 USC 1381 to 1385.
b. That if the amount in the account, in addition to the value of the resident’s other nonexempt resources, reaches the amount under 42 USC 1382 (a) (3) (B) the resident may lose eligibility for medical assistance or for supplemental security income benefits. 4. Upon the death of a resident with an account under subd. 1., the nursing facility shall promptly convey the resident’s personal funds and a final accounting of the funds to the individual administering the resident’s estate. 5. The nursing facility shall purchase a surety bond or otherwise provide satisfactory assurance of the security of all personal funds of residents that are deposited with the nursing facility. 6. The nursing facility may not impose a charge against the personal funds of a resident for any item or service for which payment is made by medical assistance or medicare. (8m) Posting of survey results. A nursing facility shall post in a place that is readily accessible to residents, residents’ family members and residents’ legal representatives, the results of the most recent survey of the facility conducted under sub. (13). (a) A nursing facility shall be administered in a manner that enables it to use its resources effectively and efficiently to attain or maintain the highest practicable physical, mental and psychosocial well-being of each resident, consistent with federal regulations. 1. The persons with an ownership or control interest in the nursing facility. 2. The persons who are officers, directors, agents or managing employees of the nursing facility. 3. The corporation, association or other company responsible for the management of the nursing facility. 4. The individual who is the administrator or director of the nursing facility. (c) The administrator of a nursing facility shall meet standards established under 42 USC 1396r (f) (4). (a) A nursing facility shall be licensed under s. 50.03 (1). (b) Except as waived under 42 USC 1396r (d) (2) (B) (i) or found under 42 USC 1396r (d) (2) (B) (ii), a nursing facility shall meet the provisions that are applicable to nursing homes of the edition of the life safety code of the national fire protection association specified in federal regulations. (a) Establish and maintain an infection control program designed to provide a safe, sanitary and comfortable environment in which residents reside and to help prevent the development and transmission of disease and infection. (b) Be designed, constructed, equipped and maintained in a manner so as to protect the health and safety of residents, personnel and the general public. (12) Compliance with laws, regulations and professional standards. (a) A nursing facility shall operate and provide services in compliance with all applicable state laws and federal regulations and with accepted professional standards and principles that apply to professionals providing services in the nursing facility. (b) A nursing facility shall meet requirements relating to the health and safety of residents or relating to physical facilities for the health and safety of residents under regulations promulgated by the federal department of health and human services. (13) Annual standard survey. A nursing facility is subject to a standard survey under 42 USC 1396r (g) (2) (A) (i). No person may notify a nursing facility or cause a nursing facility to be notified of the time or date on which the survey is scheduled to be conducted. (a) Establishing a fair mechanism meeting the requirements of 42 USC 1396r (e) (3) and (f) (3) for hearing appeals on transfers and discharges of residents from nursing facilities. (b) Specifying an instrument for use in performing assessments of residents under sub. (2) (c) 1. c.
1. Are consistent with federal regulations promulgated to interpret 42 USC 1396r. 2. Are designed so as to minimize the time between the identification of violations and final imposition of the penalties. 3. Provide incrementally more severe penalties for repeated or uncorrected deficiencies. (d) Establishing the percentage of interest to be assessed under sub. (16) (d). (a) A class “1” violation is a violation of this section or of the rules promulgated under this section which creates a condition or occurrence relating to the operation and maintenance of a nursing facility presenting a substantial probability that death or serious mental or physical harm to a resident will result therefrom. (b) A class “2” violation is a violation of this section or of the rules promulgated under this section which creates a condition or occurrence relating to the operation and maintenance of a nursing facility directly threatening to the health, safety or welfare of a resident. (c) A class “3” violation is a violation of this section or of the rules promulgated under this section which creates a condition or occurrence relating to the operation and maintenance of a nursing facility which does not directly threaten the health, safety or welfare of a resident. (d) Each day of violation constitutes a separate violation. The department shall have the burden of showing that a violation existed on each day for which a forfeiture is assessed. No forfeiture may be assessed for a condition for which the nursing facility has received a variance or waiver of a standard. (16) Forfeitures, penalty assessments and interest. 1. A class “1” violation may be subject to a forfeiture of not more than $250 for each violation. 2. A class “2” violation may be subject to a forfeiture of not more than $125 for each violation. 3. A class “3” violation may be subject to a forfeiture of not more than $60 for each violation. (b) In determining whether a forfeiture is to be imposed and in fixing the amount of the forfeiture to be imposed, if any, for a violation, factors shall be considered that are established in rules that shall be promulgated by the department consistent with federal regulations promulgated to interpret 42 USC 1396r. a. For a class “1” violation, not less than $5,100 nor more than $10,000. b. For a class “2” violation, not less than $2,600 nor more than $5,000. c. For a class “3” violation, not less than $100 nor more than $2,500. a. For a violation of sub. (2) (c) 3., $1,000. b. For a violation of sub. (2) (c) 4., $5,000. c. For a violation of sub. (13), $2,000. 3. 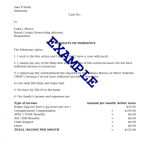 If multiple violations are involved, the penalty assessment levied under subd. 1. or 2. shall be based on the total forfeitures for all violations. (d) If the period of the violation under par. (a) is longer than one day, the penalty assessment shall additionally include interest for each day of the period at a rate established in rules that the department shall promulgate, except that no interest shall be computed for a day in the period between the date on which a request for a hearing, if any, is filed under par. (f) and the date of the conclusion of all administrative and judicial proceedings arising out of the imposition of a forfeiture under par. (a). (dm) In determining whether a forfeiture is to be imposed and in fixing the amount of the forfeiture to be imposed, if any, for a violation, factors shall be considered that are established in rules that shall be promulgated by the department consistent with federal regulations promulgated to interpret 42 USC 1396r. (e) The department may directly assess forfeitures provided for under par. (a), penalty assessments provided for under par. (c) and interest provided for under par. (d). If the department determines that a forfeiture should be assessed for a particular violation or for failure to correct it, it shall send a notice of assessment to the nursing facility. The notice shall specify the amount of the forfeiture assessed, the amount of the penalty assessment, the violation, the statute or rule alleged to have been violated, and shall inform the licensee of the right to hearing under par. (f). (f) A nursing facility may contest an assessment of forfeiture, penalty assessment or interest, if any, by sending a written request for hearing under s. 227.44 to the division of hearings and appeals created under s. 15.103 (1). The administrator may designate a hearing examiner to preside over the case and recommend a decision to the administrator under s. 227.46. The decision of the administrator shall be the final administrative decision. The division shall commence the hearing within 30 days of receipt of the request for hearing and shall issue a final decision within 15 days after the close of the hearing. Proceedings before the division are governed by ch. 227. In any petition for judicial review of a decision by the division, the department, if not the petitioner who was in the proceeding before the division, shall be the named respondent. (g) All forfeitures, penalty assessments, and interest, if any, shall be paid to the department within 10 days of receipt of notice of assessment or, if the forfeiture, penalty assessment, and interest, if any, are contested under par. (f), within 10 days of receipt of the final decision after exhaustion of administrative review, unless the final decision is appealed and the order is stayed by court order under sub. (19) (b). The department shall remit all forfeitures paid to the secretary of administration for deposit in the school fund. The department shall deposit all penalty assessments and interest in the appropriation under s. 20.435 (6) (g). (h) The attorney general may bring an action in the name of the state to collect any forfeiture, penalty assessment or interest, if any, imposed under par. (e) or (f) if the forfeiture, penalty assessment or interest, if any, has not been paid following the exhaustion of all administrative and judicial reviews. The only issue to be contested in any such action shall be whether the forfeiture, penalty assessment or interest has been paid. (16m) Appeals procedures. Appeals procedures under this section shall be consistent with the requirements specified in 42 CFR 431.151 (a) and (b). Any appeals under this section shall be filed with the division of hearings and appeals created under s. 15.103 (1). (17) Temporary management. Any nursing facility that is in violation of this section or any rule promulgated under this section may be subject to placement of a monitor or appointment of a receiver, under the procedures and criteria specified in s. 50.05 and under criteria promulgated as rules by the department under sub. (14) (c). (18) Nursing facility closure and resident transfer. (a) Any nursing facility that is in violation of this section or any rule promulgated under this section may, in an emergency as determined by the department, be subject to closure by the department or to the transfer of residents of the nursing facility to another nursing facility, or both, under criteria promulgated as rules by the department under sub. (14) (c). (b) A nursing facility may contest closure of the nursing facility or transfer of residents of the nursing facility, if any, by sending a written request for hearing under s. 227.44 to the division of hearings and appeals created under s. 15.103 (1). The administrator may designate a hearing examiner to preside over the case and recommend a decision to the administrator under s. 227.46. The decision of the administrator shall be the final administrative decision. The division shall commence the hearing within 30 days of receipt of the request for hearing and shall issue a final decision within 15 days after the close of the hearing. Proceedings before the division are governed by ch. 227. In any petition for judicial review of a decision by the division, the department, if not the petitioner who was in the proceeding before the division, shall be the named respondent. (a) All administrative remedies shall be exhausted before an agency determination under this section shall be subject to judicial review. Final decisions after hearing shall be subject to judicial review exclusively as provided in s. 227.52, except that any petition for review of department action under this section shall be filed within 15 days after receipt of notice of the final agency determination. (b) The court may stay enforcement under s. 227.54 of the department’s final decision if a showing is made that there is a substantial probability that the party seeking review will prevail on the merits and will suffer irreparable harm if a stay is not granted, and that the nursing facility will meet the requirements of this section and the rules promulgated under this section during such stay. Where a stay is granted the court may impose such conditions on the granting of the stay as may be necessary to safeguard the lives, health, rights, safety and welfare of residents, and to assure compliance by the nursing facility with the requirements of this section. (c) The attorney general may delegate to the department the authority to represent the state in any action brought to challenge department decisions prior to exhaustion of administrative remedies and final disposition by the division of hearings and appeals created under s. 15.103 (1). (20) Violations. If an act forms the basis for a violation of this section and s. 50.04, the department or the attorney general may impose sanctions in conformity with this section or under s. 50.04, but not both.